Monica Benavidez of the lifestyle blog Monica Wants It gives the details on her new Karastan custom carpet bound rug and her interior design style. I’ve always been a fan of Karastan because of their high quality and vast selection of gorgeous floor coverings. As one of the High Point Market Design Bloggers last spring, I had the opportunity to visit their showroom as they celebrated 90 years in business, and I was blown away by their commitment to excellence and quality. Being able to learn about their manufacturing process, dedicated employees and company values, plus being able to see and touch their rugs/carpets first-hand really affirmed my affinity for the brand. At their core, Karastan is committed to inspired designs, flawless craftsmanship and long-lasting materials, so your rugs and carpets can last for generations. Whether you want traditional or trendy, Karastan has you covered. Selecting a Karastan rug was an easy choice when I started planning out my home office makeover, and I immediately knew what pattern I wanted after obsessing about it for years… antelope! Karastan’s Savanna Scenes Antelope carpet collection features several colorways to choose from, and I opted for the taupe colorway because I wanted a neutral colored rug that would look good with my décor today and my décor 10 years from now. Did you know that carpet like Savanna Scenes Antelope can be cut and bound to a custom size rug? For most homes, mine included, a standard 8’x10’ is a fabulous choice for a bedroom. Antelope is the perfect bold and neutral rug choice for any space, and the pattern can be spotted often in shelter magazines. If I ever own a home one day with stairs, I’m totally using this print to make a statement on the stair treads! The subtle, ombre-inspired colors paired with the speckled antelope pattern give this rug a timeless yet on-trend look. Whether your home décor leans eclectic, contemporary, farmhouse or boho, antelope is a perfect and fail-proof choice. It adds pattern, subtle color, warmth, texture and drama all in one. Plus, it is perfect for people who love to change up their décor and want rugs that will pair well with nearly anything. 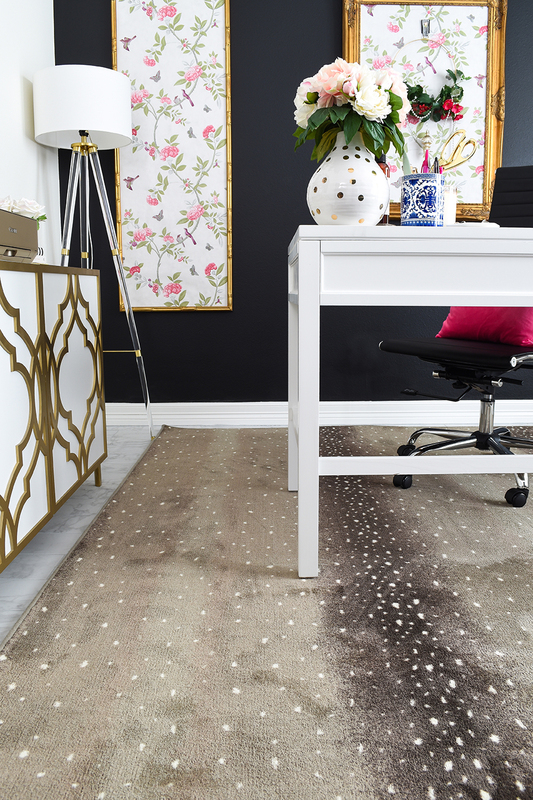 The antelope rug is a showstopper that adds warmth and contrast to my home office amidst my black and white walls and abundant florals. I love bursts of color, but I also realize a space needs some balance, which is why a large scale, simple pattern such as antelope can help ground a room that has a lot going on. The warm hues of the rug also pair beautifully with the gold and brass accents prominent in the space. The rug helps create definition in this small, square room. Ever since I added the rug in here, I feel like the furniture placement and flow has improved. 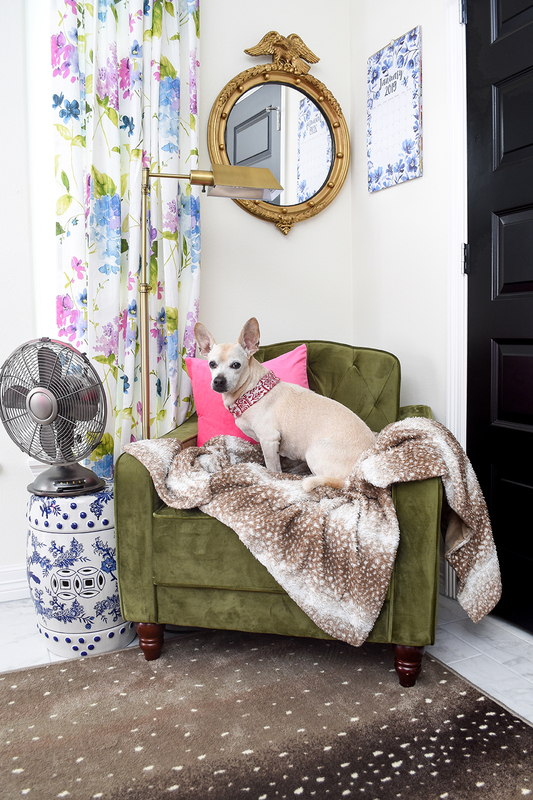 Pee Wee, my gorgeous senior dog, often keeps me company when I’m working away in my office, so selecting a durable and stain resistant rug was at the top of my list. His favorite blanket, which showcases his stylish streak, looks right at home next to the rug. Not only does the taupe color hide his hair extraordinarily well, but the Kashmere nylon fiber has lifetime stain and soil resistance should he have an accident (or I have a crafting mishap). The rug itself is incredibly plush—it’s so plush I’ve developed a habit of walking around sans my gold fuzzy slippers to enjoy the cushy feeling between my toes. Overall, I couldn’t be more thrilled to finally incorporate this pattern into my home in a space that I spend many hours in each week creating content to help people create beautifully decorated homes.